Edible Arrangements is essentially a franchising business based in the United States. It specializes in arranging fresh fruits to look like bouquets of flowers. In essence, the company melds the fruit basket concept, getting inspiration from the floral business. These gift baskets are delicious, unique and visually appealing. The arrangements provide an incredible way to brighten someone’s day. Additionally, they are ideal for special occasions like Valentine’s Day, Father’s Day, Mother’s Day and anniversaries. These baskets also make wonderful congratulatory gifts. They are also great for non-special occasions when you just want to let someone know he or she is in your thoughts. Best of all, there is Edible Arrangements coupon code for 2017 discounts you can use to lower the cost of the baskets. For a healthy gift to yourself, a colleague or a loved one, you can purchase a fresh fruit basket loaded with delicious and nutritious fruits. These include apples, pears, oranges, mangoes, and kiwis. This is a great way to express gratitude or send cheer to recipients who are more health conscious. Fruits contain an abundance of flavonoids and other phytonutrients, which contribute to overall health and wellness. They also play a role in reducing health conditions like stroke, certain forms of cancer and various heart conditions. Nuts can also be included in the gift basket. These also contribute to the remarkable health and can play a role in lowering cholesterol. 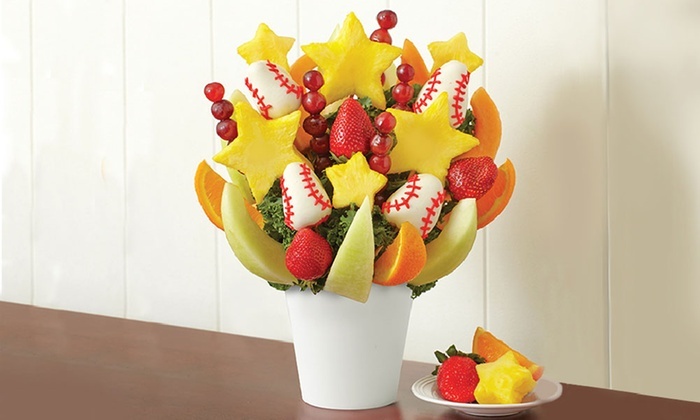 As such, Edible Arrangements fruit baskets make excellent get-well gifts as well. However, for individuals who would prefer additional sweetness in their baskets, there is the option of choosing delightful chocolate-covered fruits. These baskets are ideal for any occasion. They are fresh, handmade at a local store and will be delivered wherever you wish. The gourmet bouquets provide a uniquely delicious sentiment and they provide an amazing way to spread goodwill. The gourmet bouquet is quite popular and it includes items like chocolates, wines, cheeses, fruits and coffee. They can be as simple as an arrangement of freshly hand-picked, exotic fruits topped with beautiful ribbons or you can make them as elaborate as you desire. They can also be custom made to convey different themes for special occasions like St. Patrick’s Day, for example. This basket is a hot new concept launched recently by Edible Arrangements. It is a testament to the unyielding commitment of the company to continue to be innovative in the food-gifting industry. Their new offering has expanded the company and has taken them into the poultry space. This has intensified their reach to supply extraordinarily sweet and savory experiences to all of their customers. This new addition establishes them further as experts in the industry. Increasingly, consumers are in search of spicier experiences and as such, the company decided to venture into providing the Buffalo Wing Bouquets. This bouquet is viewed as the next step in producing something with a little more kick that is equally unforgettable. 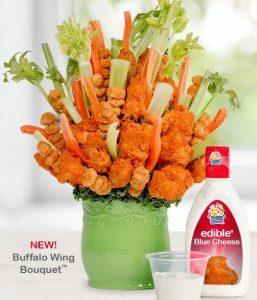 The Buffalo Wing Bouquet is beautifully and cunningly crafted with an assortment of savory flavors. This is designed to ensure the varied preferences and palettes of customers will be satisfied. The wings are assembled perfectly and artfully using crisp stalks of celery, carrots and scrumptious, crunchy popcorn chicken. The wings make a resounding statement that is guaranteed to impress any recipient. In addition, the bouquet is also ideal for tailgating parties, mainly when combined with the popular Edible Blue Cheese dressing. The launch of this bouquet came following the introduction of some innovative options by the company. For instance, the Custom Swizzle Colors are designed for customers to personalize their Chocolate Dipped Fruit. Sixty-six colors or less can be used during the customization. Whichever basket you choose, the hand-sculpted arrangements will look like blooming bouquets of flowers. They can go a long way in adding cheer to an otherwise boring or stressful day. For the best deal when buying your Edible Arrangements baskets, it is best to use an Edible Arrangements coupon code for 2017.